Stress-proof your life’s 3 step plan is effective and simple to use. Based on the new discipline of psychophysical medicine, it eliminates the deadly health effects of chronic stress. Unlike traditional stress management, stress-proof your life is based on the new discipline of psychophysical medicine and can eliminate the deadly effects of chronic stress altogether. It explains the psychophysical connection that lies at the root of chronic stress and the techniques used to beat it. The result is an easy to understand and follow stress-proofing program that works. 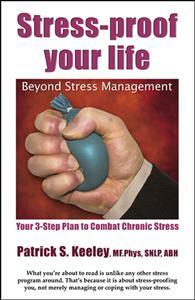 Using the 3 step plan you will be able to eliminate stress as a health issue in your life.